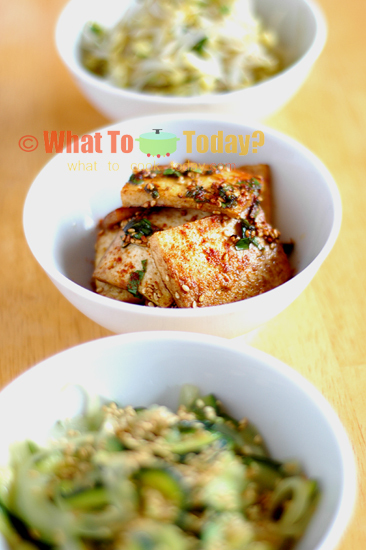 What I like about eating Korean food is all the small side dishes that accompany the meal. They are easy to make and they just make your meal feel oh-so-complete. I made the seasoned tofu from the Quick and Easy Korean cooking cookbook by Cecilia Hae-Jin Lee. Tofu is really such a versatile ingredients in Asian kitchen. Eat it on its own and it doesn’t have much taste. Use it in cooking and it absorbs whatever flavor you cook it with. The selection of tofu you can get at the grocery store these days is quite overwhelming. From soft, medium to firm texture, organic, lite, etc. The best thing is, you don’t have to go to Asian grocery store to get your tofu these days. They are almost everywhere at any grocery store. This recipe called for firm tofu as it will hold up better during cooking. 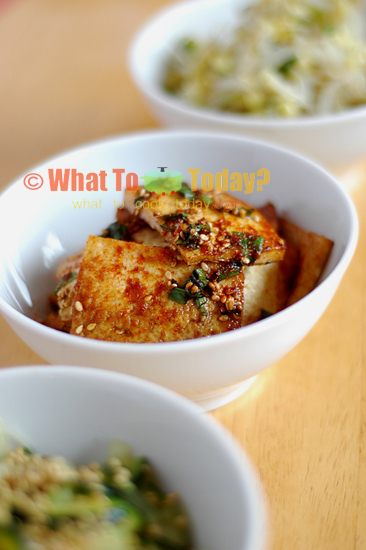 The tofu absorbs the flavor of the sesame oil, soy sauce, chili powder, and garlic. Such a simple thing yet so great.